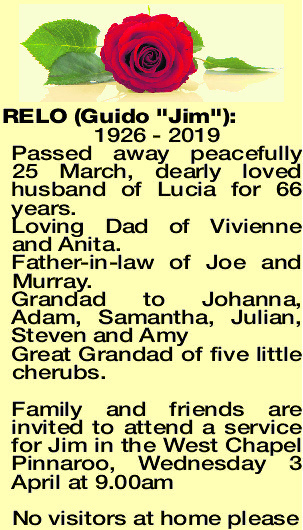 1926 - 2019 Passed away peacefully 25 March, dearly loved husband of Lucia for 66 years. Loving Dad of Vivienne and Anita. Father-in-law of Joe and Murray. Great Grandad of five little cherubs. 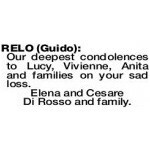 RELO GUIDO Our deepest condolences to Lucy, Vivienne, Anita and families on your sad loss. Elena and Cesare Di Rosso and family. 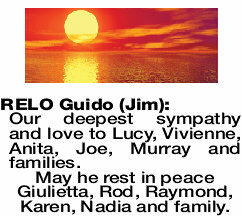 Our deepest sympathy and love to Lucy, Vivienne, Anita, Joe, Murray and families. 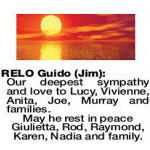 May he rest in peace Giulietta, Rod, Raymond, Karen, Nadia and family. 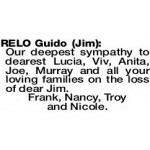 Our deepest sympathy to dearest Lucia, Viv, Anita, Joe, Murray and all your loving families on the loss of dear Jim. Frank, Nancy, Troy and Nicole. 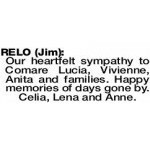 Our heartfelt sympathy to Comare Lucia, Vivienne, Anita and families. Happy memories of days gone by. Celia, Lena and Anne.